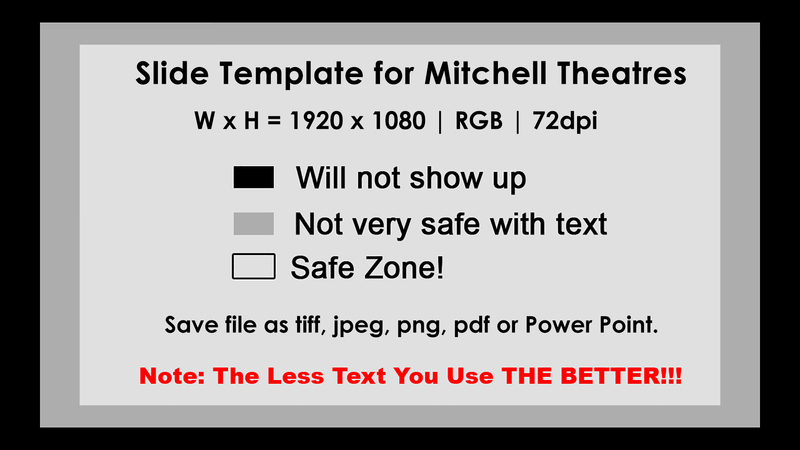 Mitchell Theatres offers on-screen slide advertising at reasonable rates. Everybody who comes to see a movie at Mitchell Theatres will see your slide before the movie starts. Take advantage of this great advertising opportunity! We require a 3 month minimum for new slides. Slides are updated on a Month to Month basis only and are updated on the first week of each month. You pay: $75 for slide design/placement* and $100 monthly. *An additional $75 will apply each time your slide is updated or replaced. There is an estimated 30 day waiting period for slides to go on screen. We do not offer video advertising, only still graphic ads. If you plan to advertise, please fill out the Slide Advertising and ACH Form. Print and fill out both forms; email them to Theatre Management, fax them to the theatre office or bring them into the Theatre Office in person. If you are looking to design your own slide, download our specs.